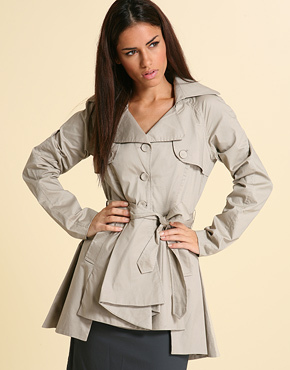 The trench coat is Spring wardrobe staple. It's a classic, it's chic, it's perfect for those April showers that bring in May flowers...and yet, I don't own a trench coat. The only thing that came close enough was a denim version by Aritzia that I had bought eons ago and now no longer fits post-pregnancy. I've been seeing more and more of the trench style over the last few years and have decided that I must acquire a trench of my own. I absolutely LOVE the one pictured above. Not only does it have the asymmetrical feature that I seem to love, but it also has a very large button detail on the back yoke. If you ask anyone who really knows me, they can tell you that I am obsessed with asymmetrical-ness and buttons...giant buttons at that. The next 2 are your classic looking trenches from the front, but the details on the back is where it's at! The first one has a cutesy bow for those who can't don't want too much fuss in their clothes. The last one has a bustle...oh my!! 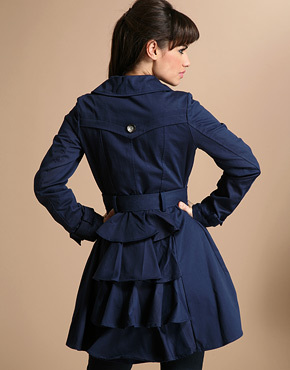 Cause of this coat, now I want to make a coat that has a bustle! I'm drooling over this deet!